I'd like to make a start on my Mirage German WW1 torpedoboat 'A86' but am really struggling to find anything at all on this class of boats - especially drawings or even photographs. I'd like to be able to detail and 'finesse' this kit but have nothing to go on. Does anyone know of a source for information on this and similar small destroyers/torpedoboats of the Kriegsmarine (I have the Mirage 'V106' as well)? They have a real archaic or 'steam-punk' look. Sorry to nitpick, but don't you mean the Kaiserliche Marine/Imperial German Navy? Last edited by wefalck on Mon Dec 09, 2013 2:52 pm, edited 1 time in total. Thanks guys. Clearly there is stuff out there - it just needs more digging out. Do you found something? In Z-Vor by Harald Fock a good plan of A 86 is included, which could be very helpful. 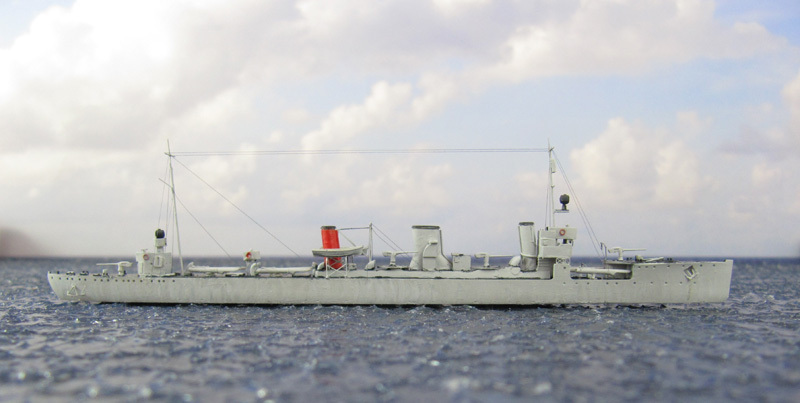 The model is built in 1/700 using the NNT kit of the B 98 and depicts her at the start of the Battle of Jutland. German destroyer. Model about 100 years. Hi! I'm just in the process of weathering my Mirage "86", and unless you REALLY want this model, it's not much fun to build! You've probably noticed details are heavy and chunky in places, and soft in others. I thought it was a "not bad" kit until I started building it. It's not terrible, but if you're used to Flyhawk, Dragon, and Trumpeter quality, it's a bit of a disappointment. On the plus side, the fit was generally fairly good. I bought the North Star PE set for it - I find the brass gauge used is very thin for 1/350 (better for 1/700), being flimsy, and pretty finniky, especially with the built-up superstructure. Takes time and patience to properly align the parts; the structure could have been better designed with fewer parts and more folds. The aft coal scuttles on the kit interfere with proper placement of the PE mine rails, so some cutting and moving will be necessary. Same thing with the outer ring around the torpedo tube - otherwise the rails will bump over that ring. Instructions contain many errors. Hope you have better luck and fun than I did! Is this model in the Central Naval Museum in St. Petersburg ? Do you have more pictures of German models from there ? Yes, there are a few German, English and French models. I took pictures of a model of the battleship "Braunschweig" made in 1902. She was a gift from Wilhelm II to tsar Nicholas II. And a couple of shots of the cruiser "Bremen". I do already have pictures of SMS BRAUNSCHWEIG, SMS BREMEN, and SMS KOLBERG for my collection. Some of them I received from the museum directly. Still have a model of the Goeben and Elbing. Alexey, are you saying that there are models of SMS GOEBEN und SMS ELBING in the Central Naval Museum ? Or where are they ? I would be very interested to have (colour) pictures of both models. Sorry no digital photos of the Goeben. Elbing were photographed on film in the early 80-ies. Perhaps the model put up in the exhibition, because the Museum has not yet fully staffed after the move. Now exposed to many new models which never existed before. I was able to photograph only 20% of the exhibits. Yes, moved. Probably better to move posts to another topic. So, has anyone compiled a list of what's available? I'm interested in 1/700 (and have the Flyhawk G-37-G-40 model) but I'm sure others would be interested in other scales.